When it comes to merging modern designs with fusion garments, the chances of working on a variety of design concepts come to fore. The very popular concepts or themes include nature and seasons. TheHLabel’s Sardi ki Dhoop collection features fusion dresses with delicate portrayal of nature on them as on a canvas, giving it the themed appearance. Women’s dresses online at TheHLabel are crafted with a good thought about the variety that fusion admirers expect from a collection. Taking up the seasonal theme with a beautifully added natural element in the floral patterns, the collection brings a fresh feel into women’s fashion made available at TheHLabel. A casual wear delight, Sardi ki Dhoop is the perfect collection for your best fashion statement made with gusto. Let’s look at a few garments from this collection of designer women’s suits. 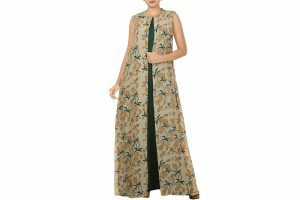 Wear this trendy double layered asymmetric maxi crafted in viscose slub. It has block print on the inner layer depicting flowers, making it fascinating to look at. Pair it with a stole and loud accessories if you wish to make the best appearance in this attire. 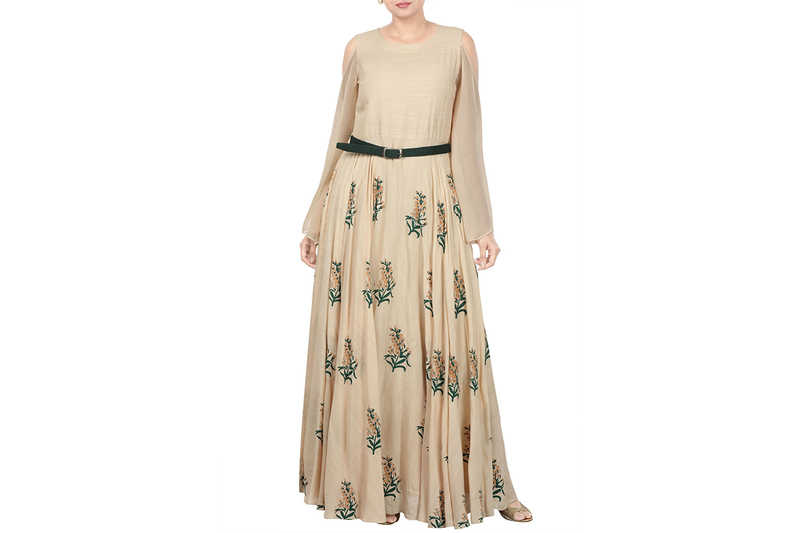 Make the best impression wearing this double layered georgette and linen maxi with digital print on the outer layer. The rear features a stylish cut design just under the neckline. The garment is crafted in georgette and linen. Heavy dupatta and statement earrings work wonders to this ensemble. Don the trend of the day with this flared maxi having flared cold shoulder sleeves. There’s block print on the flare. The garment is crafted in viscose slub and georgette and gives a great flowing appearance that hikes your style element even in casual appearances. Just pair it with floral studs and see the charm work for you. TheHLabel has the best variety in ethnic, western and fusion wear. Reach out to us online, where we offer you exclusive designer wear that you can order in customized sizes and features. Visit thehlabel.com to explore more.